Published on April 27, 2015 April 26, 2015 by Rachelle J. Currently Reading: The Dream Lover by Elizabeth Berg, a review book, The Sparrow by Mary Doria Russell, The Fiery Cross by Diana Gabaldon, and The House of Spirits by Isabel Allende for the Classics Club Spin #9. Finished: Quilt, Book, and Bard by Bryna Chalmer. I won’t be reviewing it, but I will say that I only gave it 2 stars on Goodreads because it was an exercise in frustration. I also finished The Essential Feminist Reader, and Good Omens by Terry Pratchett and Neil Gaiman. Once Upon a Time IX Progress: 3 out of 4. Show Your Shelves Some Love Progress: 14 out of 51. Outdo Yourself Progress: 22 out of 66. 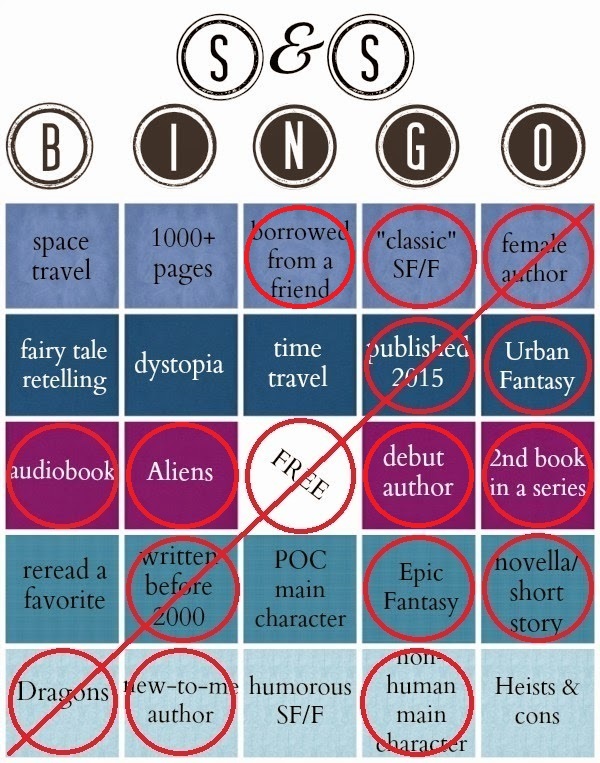 SF/F Bingo: I put Storm Front on the “borrowed from a friend” square, and Quilt, Book, and Bard on the “debut author” square. Total pages read for the week: 400 pages, the last 83% of Good Omens, and the remaining 46% of the podiobook. Total number of books for the year: 23. Dewey’s 24 Hour Readathon helped me get quite a lot of reading done. It also made me feel hungover most of Sunday and in need of detoxing. I didn’t have any caffeine on Sunday. Instead, I drank peppermint tea and lemon water, and I tried to stay away from sugar as much as possible. It’s not a party unless you feel like crap the next day, though, right? I had a blast and can’t wait until October. Most of this week is going to be insanely busy for me as I wrap up the semester. My last day of class is next Monday. I’m greatly looking forward to next Monday. How’s your back treating you? My back is doing better. At least it seems to be ok for now. It flares up at the strangest times.